A recent theme in YA lit are morality issues. A lot of authors have used young adults to ask important questions and using over arching themes in order to enter in a dialogue with others. 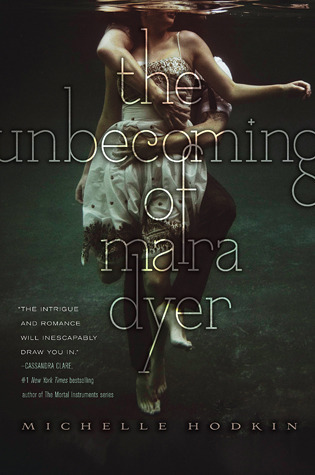 In The Unbecoming of Mara Dyer, I think it would have to do with morality issues, and should anyone ever be in charge of deciding whether someone lives or dies. Though these are the questions posed, I felt that Mara should have felt more guilt and sadness when people died, but she was lacking this moral compass in order to feel the proper emotional response in my opinion. Noah’s reactions were more realistic than hers, though not as much as I would like, but I digress. The very ending made me question if she even had morals, or had she lost them a long time ago along with her sanity? She did not see in black and white come the end, but in shades of confusing gray splotches, and it was quite unsettling. It was good, obviously, and well-written but unsettling since of course, I was rooting for her. The last quarter of the book was a little muddled and unclear. I’m not sure if this is because Hodkin was trying to make Mara’s sanity questionable or if it was just a batch of unclear writing. It was uncertain what was a dream, a vision, a hallucination, or real life. On top of this, there were so many lies. It kind of caused my mind to go on overload to understand. There was also a kidnapping scene that completely took me by surprise, but again that was something that I wasn’t even sure happened. I was so confused. That’s not to say I didn’t love it, I was just confused while loving it. 3. Writing = Book lovers paradise! I loved her dialogue, description, and writing style! Extremely witty, engaging, great personalities with great dialogue. I had to put down the book to laugh at times, or reread moments of good prose (which the book is riddled with). There were even awesome literary references to Dante, Poe (more tonal than anything), Lord of the Rings, etc. Definitely a book lovers paradise! A) Let’s just talk about Jamie’s character really quick. I liked him —loved him even, but he had so many odd characteristics rolled into one package, and it was extremely odd. He was a bigger character in the beginning of the book, but after one situation, we didn’t see him for the rest of the novel. I’m hoping Hodkin brings him back in future books, because he seemed important and then absent. B) At the beginning of the novel, Hodkin put a letter from Mara in there. To me, it didn’t make sense by the end of the novel. She will probably pick this up in the sequel, but my question is, if it doesn’t make sense by the end of the first book, why put it in there to begin with? C) I really liked how she told the background of the night Mara’s friends died. It was done throughout the course of the story, which I loved, but I wish she would have gone more in depth with those relationships. Like how did she come to date Jude? The information that she did give about Jude was all very passive, so I wish she would have added a bit more. Overall, definitely a debut novel. It had its issues but great start to what will most likely be an amazing series. Other than the slight plot holes, which I’m told she fixes a lot in the sequel, I would highly recommend this novel. I read it in about twelve hours, and for a debut novel to hook me as this one did is saying a lot! I gave this book 4.5 on my Goodreads.